There's a new Dirt game, and it's already available to play on Steam Early Access, if you're willing to pay £22.49 / $34 for the in-development build. 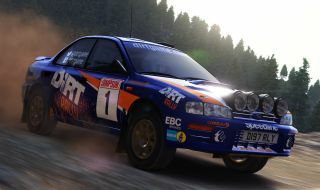 "We believe that DiRT Rally is the game many of our fans want and right now, our plan is to develop DiRT Rally with community feedback and get that experience absolutely right," Codemasters says on the Steam storefront. Dirt Rally is scheduled to remain in Early Access until the end of the year as new cars, environments and stages are added. A new website has been launched to serve as a hub for community feedback and as a stat-tracking centre for players' in-game performance. We'll test it shortly, but the Early Access edition sounds chunky, with 36 stages spread across set in Powys, Wales; Monte Carlo, Monaco and Argolis, Greece. Each stage has day and night variations and there are 14 cars to race. Between races you'll also manage a team of engineers to upgrade your fleet of vehicles. You'll find first footage in the video above, complete with some glimpses of the sweet cockpit view.